As we take leave of Shavuot and return to our humor mix, we came across a Saturday Night Live comedy skit that's only a couple of months old. But it's one that we missed while we were celebrating Passover in Israel. We thought you may have missed it too, so we're posting it now. 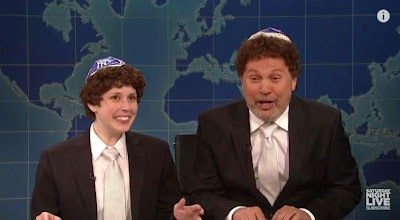 In this return of Vanessa Bayer in the role of Jacob the Bar Mitzvah Boy, one of our favorite characters, Jacob welcomes his father the podiatrist (played by Billy Crystal). Watching Billy in his role, it quickly becomes apparent where Jacob got his quirky and awkward style of reading his script and handling his interviewer.